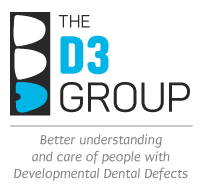 D3 Group - Developmental Dental Defects - - > What are Chalky Teeth? Not surprisingly, being a colloquialism, "chalky teeth" means different things to different people. But what we can all agree on is that chalky teeth look different – most often the enamel has an abnormal colour, either being whiter than normal or having shades of cream, yellow or brown. This discolouration is usually restricted to a small spot or bigger patch, but the whole tooth surface may be affected in severer cases. Sometimes the enamel appears dull and opaque and also crumbles easily (i.e. "chalky", in contrast to the shiny hard surface and translucency of normal enamel). Other times the surface enamel is shiny but irregular, with pits or grooves being visible from some angles. The D3 Group has adopted "chalky teeth" as a public-friendly catch-all, meaning we're not at all fussy about how the term is used. If you think one or more of your child's teeth looks a bit different and you're able to discuss this with a dental professional then that's great. Sometimes it might turn out that "chalky white spots" are actually the beginnings of tooth decay, rather than a problem with tooth development, and other times it might be a bit of both. You'll also know there are other reasons for teeth being discoloured, such as when a tooth has died after a knock. Leave it to a professional to sort out the details of what's what – but they can only do so if you make an appointment, and usually the sooner the better. That all said, we think "chalky teeth" is a good term to use when beginning a conversation about teeth that haven't developed properly, leading to enamel that isn't as hard and resistant to decay as normal – and our second step in such conversations is to talk about D3s. And for those who didn't arrive at this page from our Chalky Teeth Campaign, why don't you check out this world-first public-awareness initiative which seeks to convert medico-dental science into fewer cavities in our children? WHAT IS THE CHALKY TEETH PROBLEM? causes them and how best they can be managed. The D3 Group is tackling all three parts of this problem through this website and our other educational resources, and via the Chalky Teeth Campaign which advocates for research into the prevention of chalky teeth. Learn more about the chalky teeth problem and how we're fighting it at our Social Impact page.